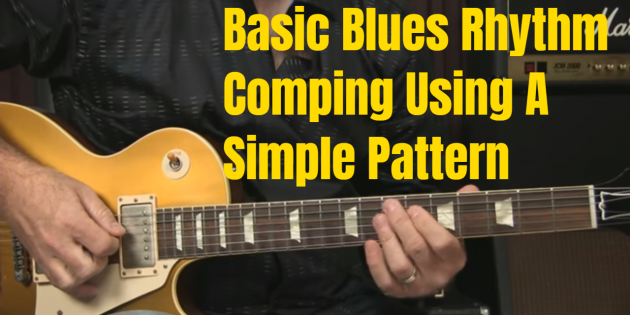 Playing blues rhythm is sometimes called “comping,” especially when we talk about playing chords behind another soloist or a singer. It’s not really a “strum pattern,” because you don’t strum, but this is really the best way to approach rhythm behind a blues shuffle. It’s nice and simple, using your trusty 2 note chords. And this pattern will get you through a LOT of songs. Nice lesson. I’ve been using a 2 note variation for the same type of backing rhythm. Your lesson gave me a new voice to use and a new way of playing it. Thanks for great lesson. Merry Christmas and Happy Holidays to you and your family. You are way cool! Thank you for this invaluable share. BTW, I have a copy of your Playing On The Porch DVD and it’s also one of those “got-to-know” things. I just can’t pick up how you’re doing the chord shapes. You go over it too fast for me. I get the strumming pattern, but I can’t get the shapes. buy his course How To Build Blues Songs, this is from that course. Griff, I miss the tabs you used to provide. I kept them in a binder for future reference and practice. Hard to find all these videos you do when I want to look back on a lesson. I have trouble forming these ‘little chords,’ thus, I usually form the full chord but only strike 2 or three strings. Anything wrong with that? Hi Griff – So I really took some time with this. I’m going to email you my worksheet for analyzing it. This is so informative. I did need to figure out what form of D9 and E9 chord you were basing your partial chords off of. I then spelled the chords – the notes and what steps of the chord each note of the full and the abbreviated chord represented. Then the chord structure of the 12 Bar Blues you were doing. The rhythm wasn’t hard. Thanks! Hi Griff, Thanks for the “little chord” Christmas present. God bless you, your family, & the band this holiday season.